Following on from my blog post ‘How to Eat for Hashi’s’, where I briefly covered meal timing, I have created ‘What to Eat for Hashi’s’ to outline the foods that should form a staple part of your diet and foods that should be avoided for optimal thyroid health. 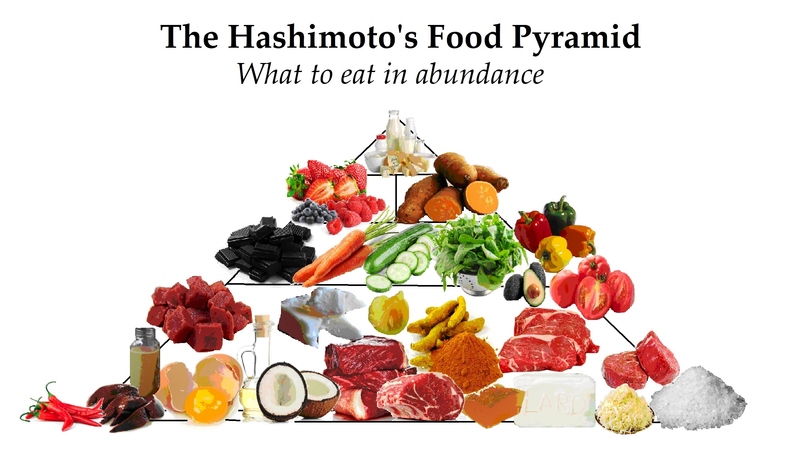 Whilst there are some special considerations for Hashi’s, most of the foods I will tell you to avoid should really be avoided by everyone and not just those with thyroid issues! If you have ever done any research on diet and thyroid health, you have probably read that you need to be using iodised salt, eating brazil nuts for their selenium and replacing all saturated fats with ‘heart healthy’ omega 3 and 6 fats. Well I am going to go completely against the grain and tell you to throw out your iodised salt shaker, put down that packet of brazil nuts and use that bottle of canola oil for your car as you will never need these ingredients again… EVER! Especially the canola – don’t you dare touch it ever again. If you want to help your Hashi’s, replacing these foods with the foods I have listed below and further avoiding the ones I have listed below is a fabulous start! Coconut Oil: Anti-inflammatory, increases body temperature and thermogenesis, supports healthy thyroid function. Egg Yolk: I am lucky enough not to be allergic to eggs so I think they are a tremendously nutrient rich food, however, eggs are typically avoided on an autoimmune diet. Yet many do not know it is the whites that contain the allergens which cause egg allergies, not the yolks. Caution is still advised when eating the yolk, however I believe they are a great dietary addition as they contain all of the nutrients required to raise an animal; if that’s not cool I don’t know what is. Oh and they help leaky gut (bonus)! Organ Meats (Especially Liver): Organ meats are the most concentrated and bioavailable sources of vitamins, minerals, essential amino acids and essential fatty acids. Liver is just about the most nutrient dense food out there; it delivers a heap of B12 and vitamin D3 (people with Hashi’s are often deficient in both of these). Bone Broth: The high levels of glycine and proline contained in bone broth aid in the healing of leaky gut and combat stress and whole body inflammation. Saturated Fats: Help combat sweet cravings, assist in weight loss, help keep hormones healthy and functioning, reduces cholesterol. Grass Fed Red Meats: The most bioavailable source of iron (people who suffer from Hashi’s are often deficient), a rich source of Conjugated Linoleic Acid which assists in satiety and weight loss, a good source of Omega 3’s (help fight inflammation – just make sure the meat is grass fed as grain fed red meats contain an undesirable Omega 6 to Omega 3 ratio. Sauerkraut: Eating fermented food improves the balance of good bacteria in our gut which helps to promote digestive enzymes. This is important for anyone suffering from an autoimmune disease as it can help in the absorption of the nutrients in our food. Celtic Sea Salt: Supports adrenal function which can be affected by a poor thyroid. Turmeric: Helps to combat the chronic inflammation caused by autoimmunity. Grass Fed Gelatin: Rich in the amino acid glycine which helps detoxify the body, improve digestion, heal leaky gut and promote hormonal balance.